Matthew Clark, born about 1660 in Northern Ireland, and died in Londonderry, New Hampshire in February 1735/6 . He was a Lieutenant during the Siege of Derry from 19 April to 10 July 1689, where he was wounded in the temple. His wound never healed and he always wore a black patch. He was ordained in 1697 and served in Kilrea and Boveedy in County Derry. On 28 April 1729 Matthew Clark left his congregation and came to Londonderry, New Hampshire to meet up with kin who were probably his children. The Rev. James MacGregor had just died in Londonderry, New Hampshire when Rev. Clark arrived. Since the town needed a minister they made him an offer, which he first refused, but then took the second offer and stayed as their minister for six more years. He married Rev. MacGregor’s widow, Mary Anne Cargill, and died 27 February 1735/6. . When he died, according to legend, his coffin was carried by fellow veterans of the Seige of Derry. It is not proven that these were his children by a first marriage, but since they all named descendants “Matthew” he was probably their father or close kin. 1. Matthew, died 28 May 1781 by drowning near Amoskeag Falls; married to Elizabeth Lindsay on 15 April 1722. Children: Margaret, Jean, George. 2. James, born about 1692, died 13 October 1768 age 77 years. He was one of the original sixteen Nutfield grantees. James Clark married first to Elizabeth Fulton, widow of James Wilson on 22 May 1722 (the mother of Ocean Born Mary Wilson); married second to Margaret Unknown. Children born in Londonderry: John born 31 March 1723 married his cousin Margaret Clark; Samuel born 12 April 1726, died 27 November 1792, married Mary Unknown and resided in Windham; George born 15 April 1728; married Mary Wilson and had thirteen children; Elliner born 20 April 1730, died 21 September 1808, married Robert Hemphill of Windham and had nine children; Matthew born 30 June 1732, died 22 January 1805; married first Margaret Anderson, married second Margaret Unknown; and Mary born about 1740 and married William McAllister and lived in Antrim, New Hampshire. 4. Agnes, married Samuel McKeen on 15 August 1723, and had eleven children. 5. Thomas, arrived in 1720 to Londonderry as a servant of James McKeen. Was granted land with his brother George. Disappears from the Londonderry, New Hampshire records by 1733. 6. George, also a servant to James McKeen, also disappeared from the Londonderry records by 1733. 7. Alexander, married Jane McGregor, daughter of Rev. James MacGregor, was a doctor in Portsmouth. Jane was buried at Forest Hill in East Derry with the epitaph “Mrs. Jane Clark, relict of Dr. Alexander died Sept. 25, 1778 in her 67th year”. “Rev. 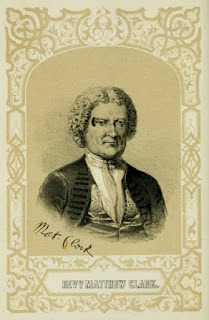 Matthew Clark of Ireland and Londonderry, N. H.” by John B. Threlfall, The American Genealogist, Volume 48 (1972), pages 21 – 26. Heather Wilkinson Rojo, "CLARK – Descendants of Nutfield Minister Rev. 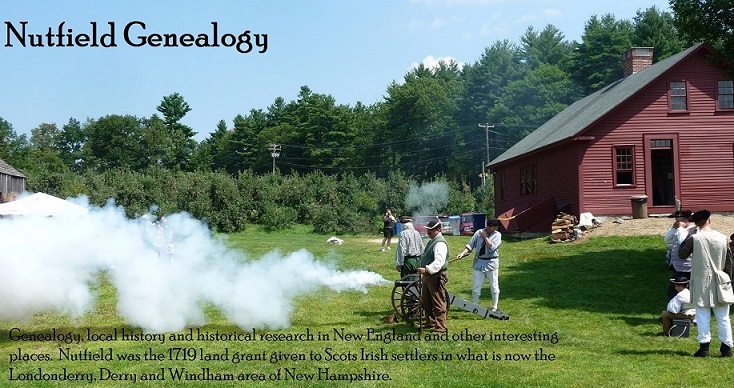 Matthew Clark", Nutfield Genealogy, posted February 9, 2019, ( https://nutfieldgenealogy.blogspot.com/2019/02/clark-descendants-of-nutfield-minister.html: accessed [access date]). I know I have read other of your blogs on this family and thank you for all you share with so many of us. James Clark and wife Elizabeth are my 7xGGparents through their daughter Eleanor (1730) and her marriage to Robert Hemphill (1731). I can see I have another cousin here as well! Thank you for this wonderful sharing as all your wonderful work with so many of our shared families. James Clark and wife Elizabeth Fulton were my 7xGGparents through their daughter Eleanor Clark (1730)m.
to Robert Hemphill (1731). I hadn't advanced to Rev. Matthew Clark yet so this was a treasure to read!